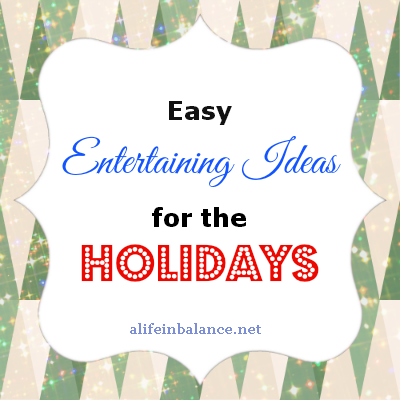 Let’s take the stress out of entertaining and make it easy for all of us for the holidays. After all, most people want to spend time with us and our families, not our smart tvs or Wii systems. Way back before we had about a gazillion kids, we used to have an Open House every October around our anniversary. Since we were young and carefree and child-less, we would make all the food from scratch. I would sit with my Martha Stewart cookbooks and magazines for weeks looking for special recipes to make. These days, I still sit with those cookbooks and magazines (yes, I still have them). Now I look for shortcuts rather than elaborate recipes. While the focus used to be on the food, nowadays our focus is on opening our home up to family and friends and having lots of conversations. Have a supply of white platters in different sizes on hand. White goes with everything. If something breaks, it’s not your great grandmother’s heirloom piece. If you need a disposable platter, the dollar store always has a selection of aluminum containers and platters. Don’t forget to pick up napkins for additional holiday color. Check out my tips on building an entertaining inventory frugally. Move furniture around if you need to provide additional seating. I like to move our kitchen chairs into the living room where we have a fire going. Instead of offering a wide selection on main and side dishes, narrow your choices down to a few dishes and provide lots of food. Use shortcuts to help you prepare the food like premade meatballs or premade appetizers from Costco or BJ’s.If you have gluten-free guests coming, Musings of a Housewife has tips for making food preparation easy. Desserts – Pick up a cake and sweets from your favorite bakery or make your own. Ask a few guests to bring a simple holiday dessert. Include ice cream and sherbert, everyone’s favorite. What’s your favorite way to entertain during the holidays? Fondue! What a great idea, plus I could actually use my set. Great tips for keeping things simple. This is such a great list of ideas. I will have to keep it in mind for years to come. Thanks for linking up to Thrifty Thursday. Great tips, Barb! I especially like your ideas for theme nights. I think everyone needs good ideas on easy entertaining. Thank you for putting this together!